So Dark the Night Review – AiPT! It is impossible not to marvel at director Joseph H. Lewis. So Dark the Night is a unique crime film released in 1946. The movie looks like many other murder mysteries of the time. The plot does not seem to do much different and it sounds very familiar. The story soon takes a twist that seems odd, but takes the movie into a different and interesting direction. When the movie ends, it is impossible not to marvel at director Joseph H. Lewis. The film starts off as many of the movies of the time do. Everything is light hearted and happy. Characters sing, everyone is smiling, and the opening is very reminiscent of Disney’s animated Beauty and the Beast. There is no hint that anything bad is going to happen. The first act of the film is almost comically upbeat and at times seems like it is out of place. It soon becomes apparent that the cheerful opening is the perfect set up for where So Dark the Night will soon be heading. Henri Cassin is a famous Parisian detective who is finally going to enjoy a much needed vacation. During his stay at an inn in the country, he quickly falls in love with the innkeeper’s daughter. Almost immediately, he becomes engaged to her despite the fact she is promised to another man. When the two turn up dead, Cassin sets out to capture their killer. So Dark the Night does a great job of explaining the main characters’ personalities and motivations. Cassin is a career workaholic who is finally ready to settle down. Nanette and her mother are looking to improve their station in life and do not care who ends up getting hurt. Nanette’s father is more pragmatic and wants what is best for his daughter. The movie may seem trite and cliche, but the characters are developed in a clever manner. The great characterization covers for what seems to be pacing issues. So Dark the Night is the definition of a whirlwind romance. Cassin falls in love and is engaged to Nanette within a week. Even though it is clear both Nanette and her mother care more about Cassin’s fame and fortune than the man himself, it still is a ridiculously short amount of time. The writing makes it clear how Nanette was able to woo Cassin so quickly. The revelation of the killer comes surprisingly early. It also seems even more absurd than the engagement. Quickly, So Dark the Night reveals what type of movie it is. On the surface, it is another murder mystery, but at its core it is something much more interesting. The supposed whodunit is a character study that looks into the mind of a person. Movies in the late 1940s did not examine killers. The extent of it was usually “he or she is a bad person because their parents did not love them enough”. There was the occasional megalomaniac, but most killers of the era were simply bad for the sake of being bad. There was no point in figuring out why they were evil; they just were. So Dark the Night looks into terms like schizophrenia. Sure, stories like Dr. Jekyll and Mr. Hyde visited the idea. But these were in fantastic situations in which a person would literally turn into a monster. Lewis’s movie is about a person who actually suffers from split personalities. The film even deals with repressed memories. This is some heady (and in some ways, brilliantly ironic) stuff for 1946. Lewis also does some great work with direction. Random use of shadows, cartoonishly evil lighting, and camera shots through windows seem odd at first. As the plot progresses and more is revealed, it becomes clear these were a way of conveying the split personalities. This is beautiful camera work that can only truly be appreciated once the whole story has been told. So Dark the Night does have its flaws. For the most part, they are a product of the time and the genre. Nanette and her mom are the stereotypically sneaky women who are taking advantage of the poor helpless males. The casting is well done, but one cannot help but wonder why there is a random hunchback in the town. So Dark the Night is an engaging murder mystery that is unlike anything of the period. The writing does a great job of fooling its audience into thinking its just another noir lite. The reveal of its killer seems ludicrous at first. It soon becomes clear that the entire movie has been leading to this one moment. 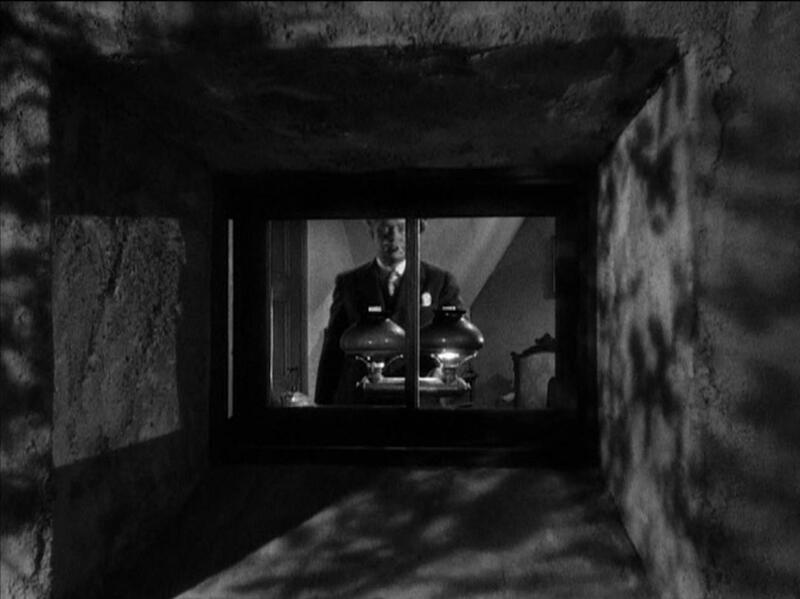 From its perfectly balanced writing to its sneakily clever camera work, So Dark the Night is a one of a kind mystery. The greatness of the movie sneaks up on you. It seems too slow and too familiar until the reveal. At this point everything makes sense.